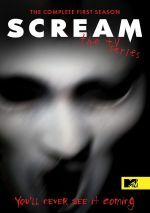 Nearly 20 years after the launch of the iconic movie series, Scream gets new life as a TV series. This 3-DVD package includes all 10 of Season One�s episodes. The plot synopses come from the DVD menus. Pilot: �The murder of a high school student stirs memories of a similar slaying that took place twenty years prior in the small town of Lakewood.� With the �Pilot�, Scream gets off to a pretty good start. In its self-referential way, the episode alludes to the challenges that come with the adaptation of a slasher tale into a TV series, and �Pilot� acts as a solid launching point. Hello Emma: �Another teen�s death raises questions and causes yet another rift between Emma (Willa Fitzgerald) and Audrey (Bex Taylor-Klaus). A provocative podcaster shows up to report on the town�s murders, past and present.� I like the fact that Scream the series reminds us of the movies but it doesn�t just replicate those efforts. The TV show feels like part of the Scream universe but it manages to branch out in positive ways. �Hello� manages to explore the characters and situations in a compelling manner. Wanna Play a Game? : �Emma learns that her mother has been keeping more secrets just as the Killer challenges her to a dangerous game.� After two solid episodes, �Play� sputters a bit. While it moves along some general plot points, it lacks the same intrigue and cleverness as its predecessors. Still, it offers enough quality to remain reasonably good. Aftermath: �Emma receives a mysterious message leading her and Audrey in search of answers.� While I thought �Play� was average overall, it ended on a taut note, and that tone carries over to �Aftermath�. Though the episode lacks the major death of �Play�, it does a lot to advance the narrative in a creepy, satisfying manner. Exposed: �After a scandalous video leak, Emma discovers a heartbreaking secret.� Along with a few revelations, �Exposed� offers a good plot-thickening episode. We get a few pieces of information and the show moves along events well, especially in the ways paranoia and mistrust blossom. Betrayed: �Emma learns that the new prime suspect in the Lakewood murders is someone close to her.� It seems like the series hasn�t killed off any characters for a while, but that seems to change here. In addition, the tension continues to escalate. We get potential clues toward the identity of the killer as well as revelations about Emma�s mother�s past in this strong show. In the Trenches: �Emma races against the clock to save a friend from the Killer�s dangerous game of hide and seek.� Cell phones made the lives of horror filmmakers much more difficult, but Scream manages to use the technology to its advantage. I appreciate the clever ways the series works modern devices into the narrative and doesn�t rely too often on the already-tired �dropped call� gimmick. Add in another significant death and �Trenches� turns into another good episode. Ghosts: �Emma reels from another death and uncovers a new secret from the past.� After the heavy dramatics of �Trenches�, �Ghosts� lacks as much heft. Still, it includes some interesting elements and delivers an intriguing ending. The Dance: �Emma doubts that the real Killer has been caught, so she teams up with Piper (Amelia Rose Blaire) to find answers at the big Halloween Dance.� With only one more episode to go, �Dance� manages to ramp up the action. It delivers a couple of prime revelations and pushes us toward the finale well. Revelations: �Emma races to save another loved one and finally finds out the Killer�s identity.� All of the plot elements lead up to a mostly strong finish. A few twists don�t work as well as I�d like, but the clues come together to give us a satisfying end to the season that wraps up the tale well. Going into Scream, I feared it�d be a cheesy little piece of TV exploitation. Instead, I got a pretty solid series that expanded the movies but didn't duplicate them. Scream fares way better than expected and satisfies on a consistent basis. Scream appears in an aspect ratio of approximately 1.78:1 on these single-sided, double-layered DVDs; the image has been enhanced for 16X9 televisions. For SD-DVD, the episodes seemed fine. Sharpness was adequate. For the most part, the shows offered reasonable clarity, but they could veer a bit soft at times. Occasional instances of jaggies and shimmering occurred, and I saw light edge haloes. No source flaws materialized. In terms of palette, the series opted for fairly subdued tones. These came across as decent, though they lacked much vivacity and could be somewhat heavy. Blacks were moderately dark, and low-light shots came across as acceptably smooth. The programs never excelled but they looked reasonably good. As for the series� Dolby Digital 5.1 soundtrack, it came with a lack of ambition. Music showed pretty good stereo presence but the soundscape did little otherwise. A few episodes came with some pizzazz but most of the effects come across as limited. Audio quality was positive. Speech became the most important factor, and the lines sounded natural and distinctive. Music was bright and peppy, and effects came across as reasonably accurate. Nothing notable came with the audio, but the sound was acceptable for the series. Only a handful of extras fill out the set. A Gag Reel runs two minutes, 52 seconds and shows a pretty typical assortment of mistakes and silliness. It seems pretty forgettable. Seven Deleted Scenes take up a total of five minutes, 33 seconds. We get clips for �Exposed� (1 scene, 0:53), �Betrayed� (2 scenes, 2:40), �Ghosts� (1 scene, 0:35) and �The Dance� (3 scenes, 1:25). These throw out a few minor character bits but nothing substantial. Finally, we see a Promotional Gallery. It includes nine short featurettes that occupy a total of eight minutes, 26 seconds. Across these, we hear from actors John Karna, Bex Taylor-Klaus, Tom Maden, Connor Weil, Carlson Young, Amadeus Serafini, Willa Fitzgerald, and Amelia Rose Blaire. They provide general character/story thoughts in these advertisements. Of course, Scream the TV series lacks the originality and creativity of the 1996 movie, but it still does very well for itself. Season One delivers an involving horror tale that keeps us interested and involved at all times. The DVD offers decent picture and audio along with a small collection of bonus materials. I like the Scream TV series and look forward to Season Two.